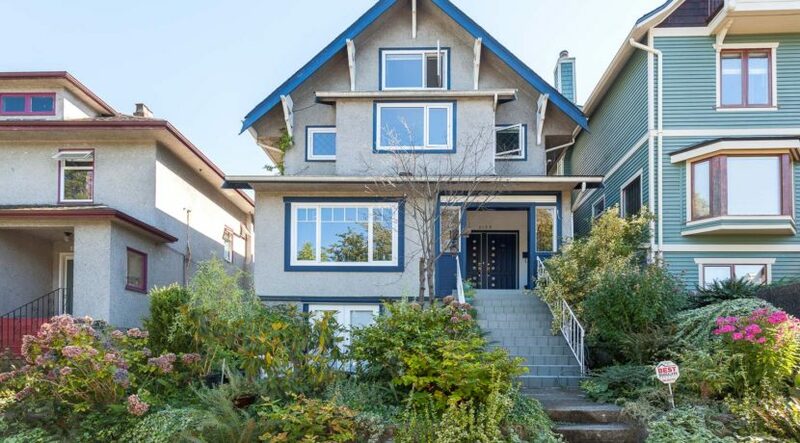 Situated on one of the best blocks in Commercial Drive with incredible views of the mountains above the tree-lined street, this grand dame 4 level 4300+ sq ft home has 4 suites. Top 2 level is a 3 bdrm, 3 bath suite with a deck + solarium off the back. Main floor is a 3 bdrm suite with a covered deck off the back. Lower level consists of 2 separate suites. One studio suite and a 2 bdrm suite. All suites have use of shared laundry or in suite laundry. Well maintained home features a fully landscaped yard and a 16′ x 8′ workshop shed. Gross rent is over $86K per year. Opportunity for investment at 3% Cap Rate or for co-sharing house. Steps to The Drive, shopping, transit, Garden Park etc. Showings by appointment only Saturday September 10th 11:30am-1pm.